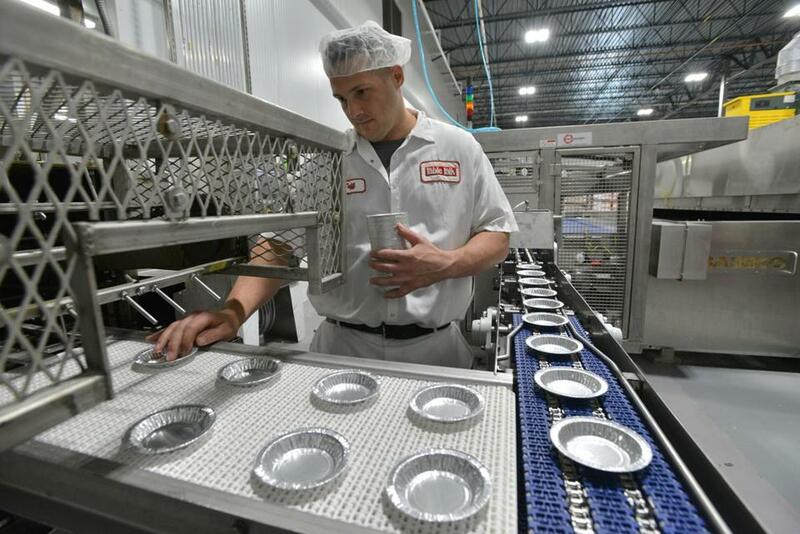 Jeff Warren, product developer for Table Talk, laid out pie tins on the assembly line at the company’s new factory in Worcester. Four-inch snack pies are getting bigger — like 1 million more pies a week bigger. The space, in the South Worcester Industrial Park, will help the company increase production of its snack pies, to 4 million a week from 3 million. The pies, which come in larger sizes, too, have long been a staple of snack shelves. They come in a variety of flavors, including lemon crunch, wildberry orchard, and apple. Harry Kokkinis, Table Talk’s owner, presided over an opening ceremony for the plant on Thursday. His grandfather, Theodore Tonna, cofounded the company in 1924 with Angelo Cotsidas and Fred Casavant. The business was sold in 1965, and fell into bankruptcy before being bought back by Kokkinis’s father, Christos Cocaine, in 1985.